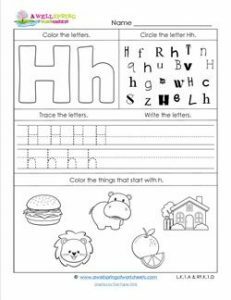 I have a set of abc worksheets. Who has the letter Hh worksheet? You do! Right here below. Just click on the Download the PDF button. I’m sure your kids will have a good time working on this page. There’s much to see and do and decisions to make. What color to color the letters, which letters are the Hh’s, and which one or two or three of the objects start with the /h/ sound. Don’t forget the letter tracing, and letter writing, too.